The passenger compartment remained stable during the impact. Dummy readings indicated that the knees and femurs of the driver and passenger were well protected. Honda showed that occupants of different sizes and those sitting in different positions would be similarly well protected. The passenger's chest was compressed more than the driver's and this value was used for the calculation of the rating. In the pole side impact, protection of the chest was weak. Protection against whiplash injuries in a rear impact was marginal. Maximum points were scored for protection of the 3 year infant based on the dummy result from the impact tests. The passenger airbag can be disabled to allow a rearward-facing child restraint to be used in that position. However, information presented to the driver regarding the status of the airbag is not sufficiently clear. A warning label clearly warns of the danger of using a rearward facing child seat in the passenger seat without first disabling the airbag, but the information is not available in all European languages. The presence of ISOFIX anchorages in the rear outboard seats is not clearly marked. The bumper scored maximum points for the protection offered to pedestrians' legs in the area rated by Euro NCAP. However, additional tests showed that some areas beyond the central zone provided poor protection. Most of the zones tested in the area of the bonnet where a child's head might strike also scored maximum points. However, the front edge of the bonnet was rated as poor. Electronic Stability Control is standard equipment on all of the model range. 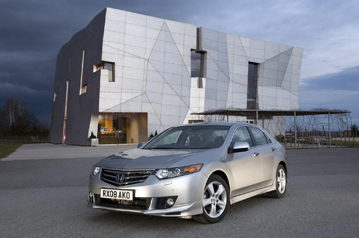 The Accord has a seatbelt reminder system which covers all seating positions.